President Muhammadu Buhari addresses Benue leaders during a visit to the state on March 12, 2018. President Muhammadu Buhari has appealed to leaders of various groups in Benue State to convince their constituents that the Federal Government is doing its best to end the recurring attacks by armed herdsmen in various parts of the country. He made the plea on Monday while responding to remarks by various stakeholders during a Town Hall meeting at the Government House in Makurdi, the state capital. 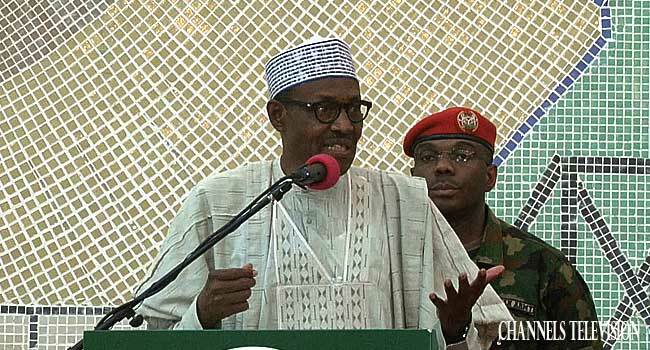 The President, who spoke during his visit to Benue to condole with victims of herdsmen attacks in the state, urged the stakeholders to show restraint and allow the security agencies to handle the untenable situation. “I urge you to keep in touch with them and advise them to live peacefully. Nigeria has over 250 ethnic groups with different cultures and nobody can question God for putting us together,” he added in a statement by his Special Adviser on Media and Publicity, Mr Femi Adesina. In the heat of the attacks in January, President Buhari had ordered the Inspector General of Police (IGP), Mr Ibrahim Idris, to relocate to Benue to stop further killings of innocent citizens in the state. Although the police boss heeded the President’s directive, he was said to have spent just one night in the state after which he reportedly left for Nasarawa State. In his response, President Buhari who noted that he just got to know about that said he was not in the habit of publicly rebuking his appointees as many would desire. He, however, said that he preferred to quietly “read the riot act” as he did to the police boss when the Benue attacks began. On steps taken to tackling the killings, the President disclosed that he shared the IGP’s security report on the Benue crisis with Senators George Akume and Barnabas Gemade from the state. He further recalled his Civil War era memories with military officers from Benue, noting that his nostalgic experience with such persons would never allow him to do harm to the state. President Buhari, while thanking God for the good rains, lauded the successful efforts of the Minister of Agriculture, Audu Ogbeh, an indigene of Benue State. He described the minister as “a great asset in my government,” saying his administration would continue to empower farmers with loans by the Central Bank of Nigeria (CBN). To this end, the President was delighted that the agricultural policy of his administration has led to 90 per cent reduction in rice importation. Reacting to what he called a “shopping list” by some stakeholders, President Buhari urged them to pray for the economy to improve, noting that he would not make any promises during this trip. Earlier, Governor Ortom thanked the President for visiting and listening patiently to the representatives of socio-cultural groups, farmers, herdsmen, national and state legislators, former leaders and elder statesmen, among others. The governor described President Buhari as “a father known for his integrity and fight for justice” and urged him to ensure the victims of the attacks are compensated among other demands.